I've been to Belgium before and been through my fair share of beer pubs and pub snacks, but I never ran into this particular pub delicacy, Pottekeis. So, my interest was piqued when I saw it on Glorious Food & Wine. 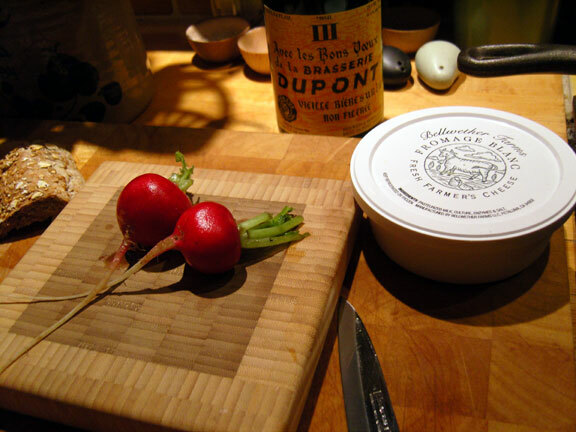 Luckily, I was going to a friend's house for a lite meal and needed to bring something along with a fantastic bottle of Avec Les Bon Voeux. 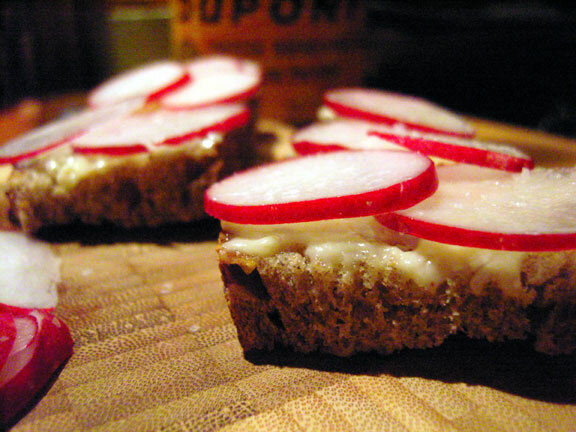 Pottekeis is pretty much an open-faced cheese sandwich. Or more specifically, a stinky cheese sandwich. It's simply a mix of fromage blanc and fromage de Bruxelles. The fromage blanc was the easy part, but the fromage de Bruxelles (Brussels cheese) was something that none of my cheese shops had ever heard of. I pieced together enough info to know that it is a cow's milk cheese which is smooth and spreadable. It's strong odored, salty and sharp. With this info, my cheesemonger and I decided that a Munster from Alsace was probably as close as we could get. He had a beautiful Munster Alsace finished/washed with Gewurztraminer which was very pungent to the nose, but was actually quite mild once eaten. I am still going to hunt for the actual fromage de Bruxelles, so that I have a proper comparison, but regardless, the Pottekeis I made was very delicious. 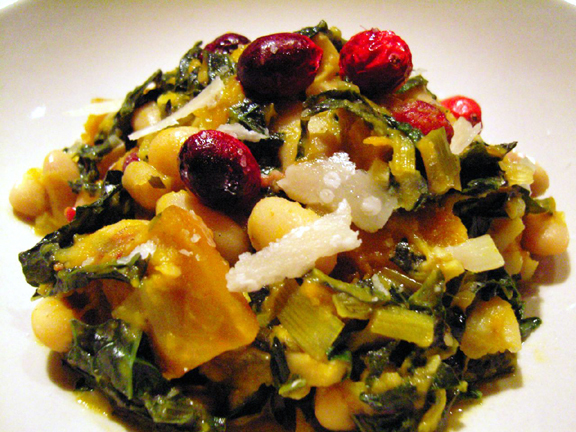 The Avec Les Bon Voeux went perfectly with it as well. I have been waiting for Brasserie Dupont to release this year's Bon Voeux. It's probably my favorite of all beers. Dupont makes it as their Holiday beer. They originally used it as New Year's presents for their best clients, but it really stands as more than a holiday beer. It's fantastically refreshing in the summer. It's a big alcohol (9.5% abv), sharp, citrusy blonde ale, with lots of yeasty aromas as well as some wheat notes and a bit of peppery spiciness on the finish. Overall, it's a very complex Saison with some sweetness and a pleasant dryness. Bon Voeux can be hard to find, but more than worthwhile to search out. Once that I found it this month, I grabbed two cases of it to last me the year. If you can find it on draft, it is really a tremendous experience, best enjoyed with some pleasant company and some p âté and cheese. 1/2 of a Bellwether Fromage Blanc- 7.5oz - about 3.75-4 oz total. This recipe will serve more than 4 full slices of bread. Combine the two cheeses in a bowl and mix thoroughly till smooth. Soften the butter and then whip that in with the finely diced shallot and cayenne. Slice the multigrain or brown bread into thick slices and toast them. 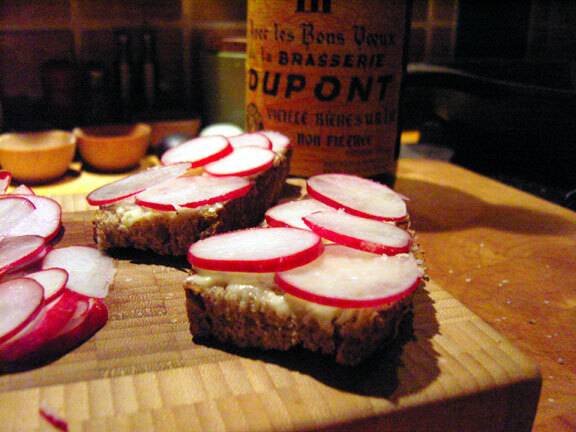 Spread the mixture onto the toasts, top with sliced radishes and top with freshly cracked black pepper and sea salt to taste. Enjoy with a fine Belgian golden ale or Gueze.